Measure to the center of the 30 inch side (15 inches) on the back side of both boards and make a small mark. Line up the center of the pattern you used for cutting the felt when stabilizing your fans up with the mark, then adjust the pattern down an inch or two so you have a smaller half circle and trace it onto the back side of the boards. Cut along the line with the razor blade/exacto knife using the cutting mat to protect your work surface. Put the boards back to back, the half circles should line up. Measure an inch or two to one side of each half circle (should be opposite sides) and punch a single hole. When you are done with this step each board should have a half circle and one hole punched in it and the holes should be on opposite sides of the half circle when the boards are placed back to back. Next punch four holes in each board approximately one inch in from the long edge 5 or 6 inches in from the short edge. Take your ribbon and measure off how much you would like for your handle. Then fold the remaining ribbon in 8ths and cut 8 pieces of the same length. Take the piece for your handle and tie a double knot in one end. Feed the ribbon through the single hole next to the half circle on one board going from the back side to the front, then feed it through the single hole next to the half circle on the other board going from the front side to the back and tie another double knot. You now have your handle. Take each of the 8 ribbons you cut and tie a double knot in the end of them. 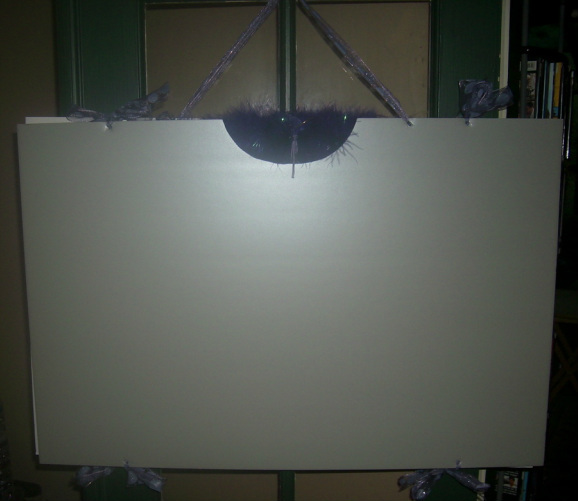 Feed each ribbon through one of the holes on the foam-core board going from the back side to the front. Tie the four ribbons along the edge with the handle together. You now should have what looks like a book held together by the ribbons along the edge with the handle. Place your fans together with the part where the staves come together in the half circles on one board, fold the other board over the top and tie the other four ribbons together. Your fans are now in their carrying case and should not slip out the bottom as they are held in place by the part where the staves are held together being wider than the space between the boards.